Thumbcuffs!!! This update is all about thumbcuffs, not one pair, but four pairs! We have some very unique and creative poses for Gina, a new model with beautiful golden hair, camouflage skirt and bare feet :-) She cuffs her own thumbs to the loops of her skirt, manages to get all four pairs on her fingers and even cuffs her big toes with the clunky Russian BR-S thumcbuffs! If you are a fan of thumbcuffs, you will really be pleased with this gorgeous extra large picture set (100 pictures)! We decided to switch updates – our own content on Fridays, Found pictures on Mondays :-) So here’s Laura, a very openminded and easygoing girl! She showed up in a white corset with tribal markings, which looks absolutely stunning. She was really curious about all the handcuffs we have, so we definitely will see more of her! 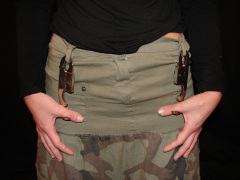 This time she is cuffing herself with a pair of darby style Hiatt’s (adjustable), in front and behind her back. If you like pictures of a very relaxed model, this extra large set (100 pictures) is for you! This week we have a nice picture set with Alcyon cuffs featuring model Anouk. Her nice slender arms and wrists look great in the Alcyon 5050 and the very rigid Alcyon 5050 Reg! We had a lot of fun shooting this, Anouk is a really nice model to work with! The picture of her inner wrist tattoo reflected in her handcuffs is an instant classic :-) Later in this set we used a pair of Yuil thumbcuffs on her thumbs and toes as well, in fact we got so carried away we ended up with lots of pictures, so we decided to make this picture set DOUBLE size (150 pictures)!